17:00 UTC and it’s Keynote time! No technical glitches to hold us up this time and CCP Falcon took to the stage in a clearly confident and happy manner. He expressed his delight at being there and we were left in no doubt that he was clearly confident that we would share this feeling as the keynote progressed. The 49 candidates for the Council of Stellar Management were displayed for us all to see and the importance of the CSM to CCP was stressed as CCP Falcon urged us all to get out and vote. Falcon then did a small review of everything that had happened in the last year – moon mining changes, the structures 2.0 release, and some of the widest balance passes in years, just to name a few highlights. We then saw an interesting attempt at roleplay as a representative of Concord (AKA CCP Burger) talked us through what had been happening to the Drifters we had noticed appearing damaged in large numbers, before CCP Rise took over and introduced us to the Triglavian Collective. We will have an in-depth article on this soon, and believe me, it’s going to need some depth. The quick overview is that new areas of space have been discovered. They are called Abyssal Depths and it is in here that the Drifters and the Triglavians have been fighting. Video fragments obtained after sending a lone cruiser into the Depths showed us that there were three new vessels that we would have to contend with if we chose to venture there – and we will most certainly choose to do that. A frigate known as a Demavik, a cruiser, the Vedmak and a battleship, the Leshak await the brave adventurer. Adventurers can’t go in anything other than a cruiser, which is going to be entertaining when you come up against that battleship. The Triglavian Collective ships have a single weapon, an Entropic Disintegrator. This is a beast of a weapon that ramps up its power steadily, the longer you fire it, up to a level 50% above where it started and provides a mix of thermal and explosive damage. It has no falloff however and will stop firing as soon as you move out of its optimal range. The Triglavian ships have a large amount of utility highs and plenty of lows. Entering the Abyssal Depths requires you to find Abyssal Filaments, which can be activated immediately to take you down. A beacon is left on the ‘surface’ to mark where you went in, which is handy as it’s the only way out. It is less handy however, as the beacon can be scanned down by anyone, allowing attackers to then sit there and wait for you to return. The filaments can be sold on the market, and each one contains data that shows you how difficult the depth it leads to actually is. and equally, when it goes wrong… can’t wait. CCP Seagull then came out and explained that this formed the heart of the next expansion, Into the Abyss. The expansion is not just about the Abyssal Depths however, and CCP Seagull managed to get what was probably the loudest cheer of the day when she announced that one of the new elements would be a ‘quality of life’ pass on Planetary Interaction (PI), with over 20 UX tweaks to come, including pin placement without re-selection, a clear indication if your setup is incomplete, and loads of tooltips to make the whole thing easier to use. There will be a new interactive Activity Tracker that will show you what you have done in Eve and what you can do going forward. It looks very pretty, but it seemed from what CCP Seagull was saying it won’t pick up what you had done in the past, only from the point where you start using it. In addition to this, a change was announced to Faction Warfare, in that ships fitted with Warp Core Stabilisers would no longer be able to enter Faction Warfare Complexes. This change was also warmly greeted, as was the date for the expansion to roll out which is on May 29 – no time at all. Back came CCP Falcon to announce more ways in which CCP were celebrating fifteen years of Eve Online. Apparel first, with new shirts and caps, and then the announcement of a new pod skin for everyone who logs in during the thirty days prior to May 6 along with an Apotheosis-class hull with its own limited edition skin. You will get these gifts as an Omega, or as an Alpha, however if you are an Omega, you will additionally receive a Sunesis, a Gnosis, and an all new Praxis battleship hull, and they will also have XVth Anniversary skins. An event will also be also be running at the time. Operation: Conscious Interruption will pitch capsuleers against Drifters as the Drifters attempt to disrupt the distribution of the Praxis hulls. Capsuleers will be involved in both offensive and defensive battles on behalf of the Society of Conscious Thought, with plenty of rewards coming the way of those prepared to take the Drifters on. The Alliance Tournament was next up. 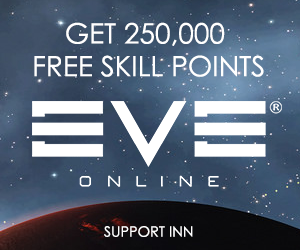 It will be run by CCP in collaboration with EVE-NT, and will take place over four weekends starting on July 28 and 29, until the finals on August 18 through 19. Better get practicing! After another insight into Eve gameplay from CCP Hellmar, Seagull came back to talk about how CCP was approaching the game on our behalf. 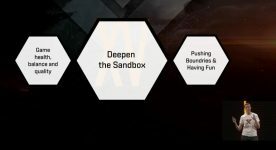 Three main pillars were discussed, covering elements such as game depth, balance and quality, deepening the sandbox, pushing boundaries and straight up having fun. 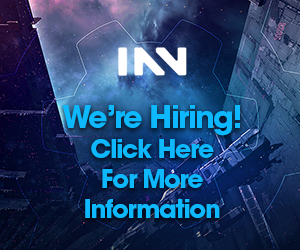 More changes were coming, with balance passes to navy battleships, more opportunities for space colonisation, and of course the rollout on June 5 of station changes as they will then be replaced with unique, bonused faction citadels that will belong to whoever is controlling that space at the time of the release. Seagull then earned the third loudest cheer of the day when she announced that Logistics would finally appear on kill reports, alongside killmarks, detailed damage information, and EWAR. No release date for that yet. CCP Hellmar then rounded up the keynote, reminding us of two main items that we should take from all that had been said. Depth with meaningful decisions, and most interestingly, the fact that the changes being driven by the introduction of the Abyssal Depths would drive the betterment of the whole game for decades to come. Is it just me or is the Abyss not “sandy” enough. Wormhole space was intended to be a place you would visit and then come back from but players decided to live there and it’s got loads of sandbox activities to do there. It’s a real asset to the game. 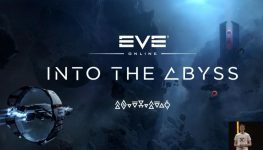 The Abyss is gated, it’s CCP just gripping onto the controls out of fear and only letting you in for a predetermined thrill ride and then spitting you out. There’s no sand at all, it’s just the same as missions which are terrible, except worse because there’s no change for ninja salvaging. They keep saying they want to make more sandox tools but then they actually make themepark features. Er…. you leave a beacon that people like me can scan down and find you. Then we just settle in, pop a bubble and have some popcorn while we wait for your unique snowflake fit to make its way back to K-space to loot your wreck. How is that different from scanning people down when they’re doing missions? Surely everyone will set off into the Abyss either in highsec or in their Null captial systems where their freinds will watch out for them?